Did you know that you can have a delicious vegan bolognese using lentils as a wonderful substitute for meat? No? 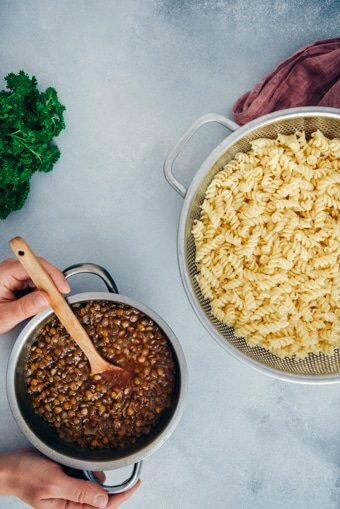 Try this fiber-loaded, protein-rich lentil bolognese recipe RIGHT NOW! This is the most innocent AND TASTIEST pasta sauce ever! Serve hot as a main dish or cold as a salad for potluck parties. When I don’t have so much time for cooking, which is quite often, I usually resort to cooking pasta to have a quick dinner. It is delicious and the folks at home love it. Who doesn’t like a bowl of bolognese or pasta with pesto sauce, anyways? Although it is practical and delicious, I don’t want to have pasta for dinner very often. It is not the healthiest and lightest food when mixed with heavy and creamy sauces or meat. A while ago, I was thinking on a pasta sauce that is not heavy but not boring either when I realized the leftover Vegan Lentil Stew in the refrigerator. As we love to pair it with any pasta, I thought turning it into a sauce over pasta would be great. That’s how I discovered that I can use lentils instead of meat and still have a delicious bolognese sauce. Now I can have pasta as often as I want without any worries with this lentil bolognese. You will need only 20 minutes for this lentil pasta bolognese. Let’s start! First, cook your lentil sauce. You don’t need to soak lentils beforehand. They cook really fast. Heat olive oil in a sauce pan, add chopped onion and sauté until tender. Add in tomato paste and cook for 5 minutes. Add in green lentils and the spices. Pour 1 cup of water. Cook until lentils are tender. 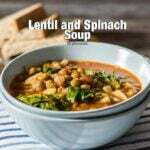 If you are in hurry, you can always use canned lentils. It will save you about 10 minutes. Rinse them under running water and drain before using though to remove some of the sodium they contain. Second, cook pasta according to the package directions. The classic pasta for bolognese is spaghetti but you can always go with other types such as twists or manicotti. If you want a gluten-free meal, you can even use gluten-free pasta or zucchini pastas for this recipe. Third, pour the lentil sauce over the cooked pasta. Sprinkle chopped parsley and stir. Voilà! Your bolognese is ready. You can serve it either hot as a main dish or cold as a salad. Tip: Cook the pasta after you start making the sauce. Pasta takes shorter time so you can finish your pasta and the sauce at the same time. 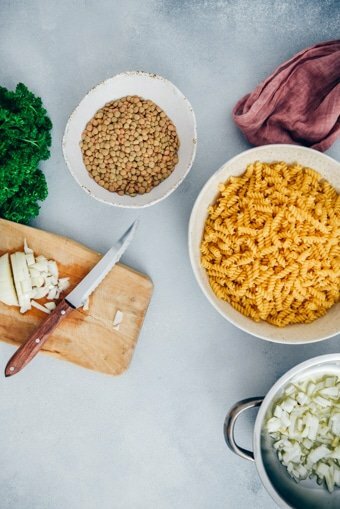 Which Lentils For Lentil Bolognese Sauce? Green lentils are the best for bolognese because they keep their shape. 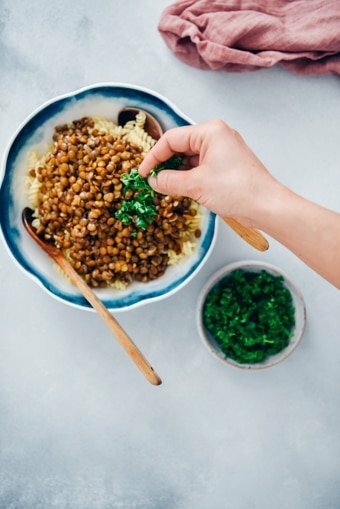 Cooking green lentils is not a hassle. They will become tender in less than 15 minutes. Plus, you can always use canned lentils if you are short of time. What I do is to cook lentils in large amounts when I have time at home and store them in small packs in the freezer. So when I want something really fast, I take out a pack and use it. At least it is home packed and as quick as canned ones. On the other hand, if red lentils are what you have on hand when making this recipe, go ahead and use them. They will just be mushier than green lentils. No problem in a sauce at all! Lentils are one of the key ingredients in my kitchen. They give a rich flavor and texture to the food. And it is not only about taste and texture. 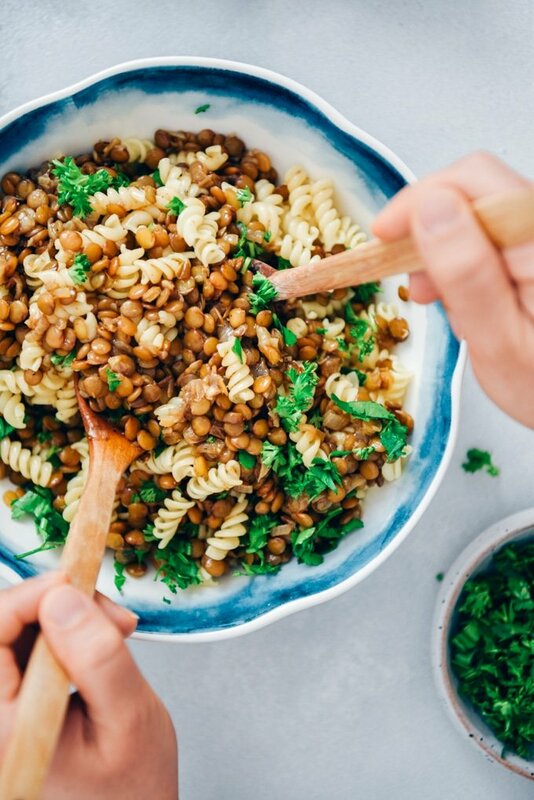 Lentils are health treasures. 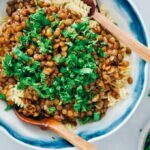 For one thing, they are a very good source plant-based proteins, which make up over 25 percent of lentils. 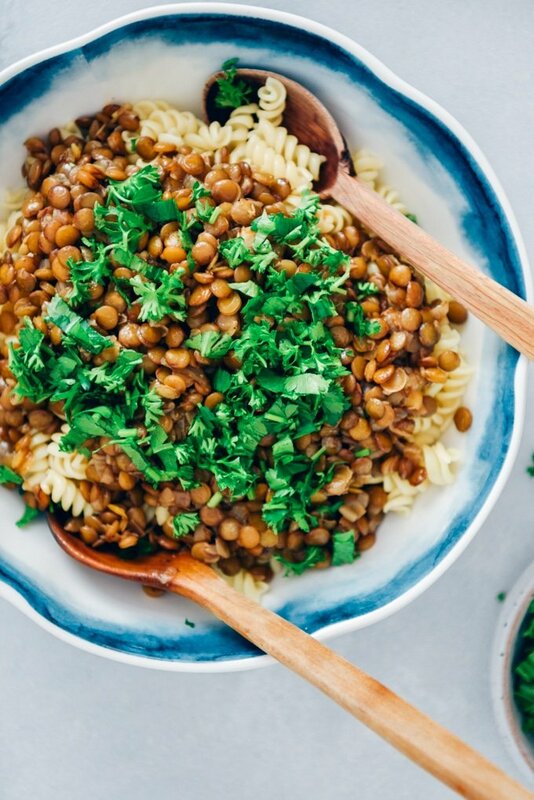 If you are vegetarian or vegan, lentils should be a staple in your diet. However, lentils are not only good for vegan folks. Everyone should include lentils in their diet because they have LOTS of benefits to our body. For example, they are loaded with iron, which has an important role in blood flow in the body. In addition, they are packed with fiber, which supports digestion system and balances cholesterol levels. Believe it or not, they are an excellent source of calcium, which is another great thing for vegans or for those with a dairy-free diet. What’s more, lentils are quite important for pregnant women because they are rich in folic acid. Also, they are loaded with vitamin B, potassium, zinc and magnesium. Well, on top of the reasons why I often use lentils in my cooking is not their health benefits. I LOVE their taste! So tasty and filling. Another cool thing about lentils is that I can use and adapt lentils in many ways. They sometimes come in handy to enrich my Bulgur Pilaf, another delicious vegan dish. Or I paste them and turn them into healthy but yummy Turkish Vegan Lentil Meatballs. And I am telling you, this finger food disappears quite fast. Lentils also make the salads they go in delicious. 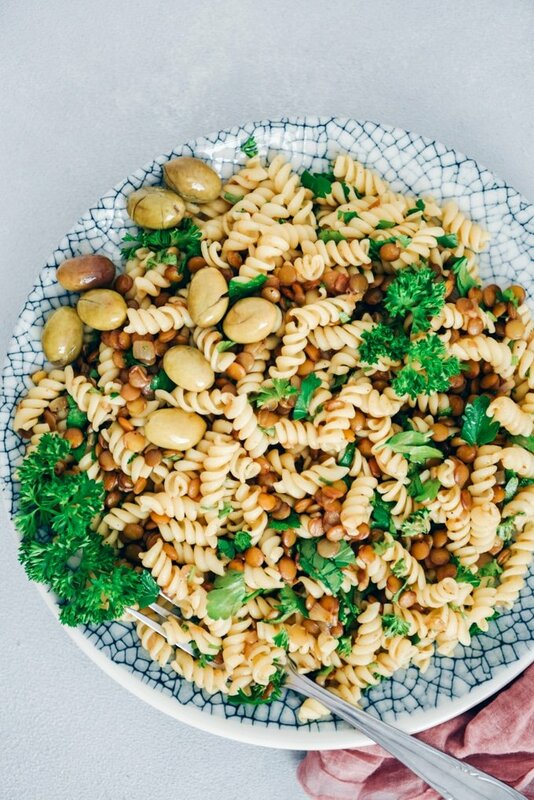 When I want something really fresh and healthy, I make summer vegan pasta salad. When I want to go even lighter, Kalyn’s recipe for Lentil Salad is mostly the one I go for. 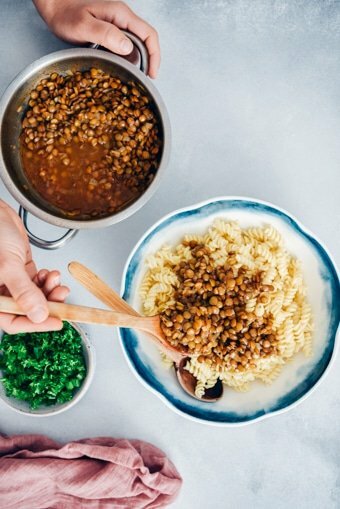 Is This Lentil Bolognese Vegan? Yes! The sauce is 100% vegan. As for the pasta, almost all packaged pasta is vegan too. Check the ingredients on your package to be sure. Fresh pasta, however, usually contains eggs, so stay away from it if you are following a vegan diet. This vegan pasta bolognese is a great dish for vegans because protein-rich lentils are great alternatives to meat. How To Defrost Vegan Bolognese Sauce? You can make more sauce than you need for the pasta in one go and store the rest for later usage. You can cook new pasta and use this ready frozen sauce during the week. 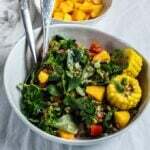 I usually portion it out into individual servings and freeze them so we can turn it into an easy stew with additions of vegetables like mushroom or cauliflower for a quick and healthy lunch. You don’t need to thaw the frozen lentils, just reheat them over low heat. To combine them with vegetables, cook the vegetables beforehand and combine with the lentil sauce. You can play on this recipe however you want. You can add some walnuts to have some healthy fats. Or you can add in mushrooms or tofu for a meaty flavor and more protein. Carrots would add a nice sweet taste and extra vitamins. Endless of options. Also, when I feel like I have to watch my weight, I have this bolognese with less pasta and more sauce. Yummissimo! Sounds delicious Zerrin. I’ve been thinking about you with the political news from the election in Turkey! Thanks for the shout-out for my Vegan Lentil Salad. Thank you Kalyn! Oh are you following the elections here? The mayor of the biggest city in Turkey is still not officially accepted. Just another thing in the country that is hard to understand. Anyway, your lentil salad is a favorite of my family. Even our 6-year-old son loves it so much.